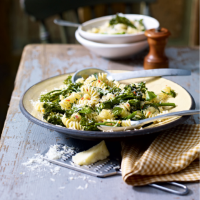 This lovely, colourful pasta dish is an easy midweek meal livened up with a kick of chilli. 1. Preheat the oven to 220°C, gas mark 7. Cook the pasta in a pan of boiling water according to packet instructions. 2. Meanwhile, toss together the broccoli, garlic, lemon zest, chilli and half of the pecorino. Drizzle over 2 tablespoons of the olive oil and stir until everything is coated. Spread out evenly on a large, non-stick baking tray and roast for 6–8 minutes, or until the broccoli is tender and just beginning to brown. 3. Reserve 100ml of the pasta cooking water then drain the pasta and return to the pan. Stir in the roasted broccoli, reserved cooking liquid, remaining tablespoon of olive oil and most of the basil leaves4. 4. Spoon into pasta bowls, sprinkle with the remaining pecorino, basil leaves and a good grinding of black pepper. Serve swiftly. use Parmigiano Reggiano or Grana Padano instead.